Stewart R: One of the true successes of the inital Marvel NOW! push was Dennis Hopeless' Avengers Arena where a group of troubled teen heroes from Marvel's C-List and further obscure alphabetical categories captured by Arcade and forced to fight in a battle to the death. It was an emotional rollercoaster of thrills with Hopeless displaying fine skills at giving each member of the wide cast a distinctive voice and showing that even heroes in waiting may crack when put into a lethal predicament. And it's sure to be some of those cracks that come squarely into focus with the launch this week of Avengers Undercover #1. Scarred by the events under the dome of Murderworld this ragtag group of powered and talented teens will be given the opportunity to infiltrate Baron Zemo's Masters of Evil, but will they all be able to stay on mission or will one, some, or all of them be lured by their darkest desires and resentment at the hero community for failing them when they needed them most? 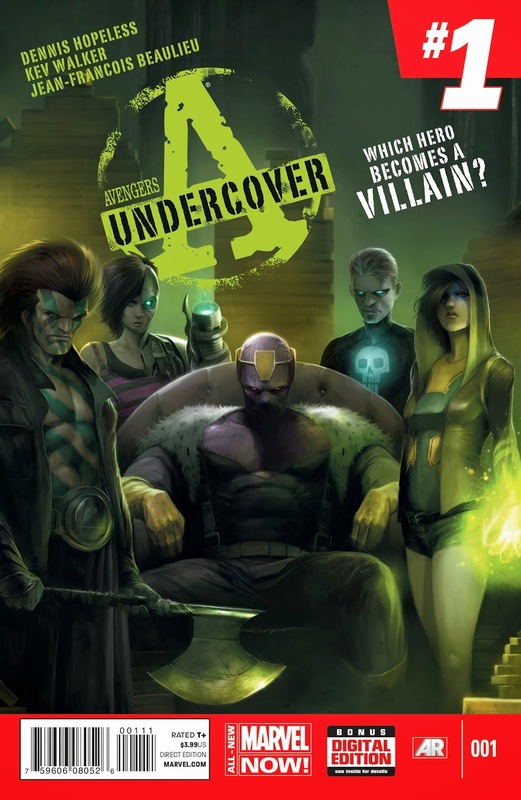 The interesting thing is that the Marvel blurb at Newsarama and CBR states 'five conflicted young superhumans are out to prove to the world they can still be heroes', yet then lists seven characters - will we see yet more heads roll, or are some of them villains already?? I really can't wait to find out! Elsewhere around a somewhat quiet week for the PCG I'll of course be picking up East of West #10 as the series has remained consistently strong since its inception, Marvel's (arguably) funniest title in the form of Superior Foes Of Spider-Man #9 and Indestructible #4 from IDW which is proving to be an entertaining and interesting look at the celebrity of superpowers from the perspective of someone mistaken for having powers through a comedy of errors. Matt C: With the London Super Comic Con looming ahead of me this weekend I'm rather relieved to find a diminished number of books on my pull-list this Wednesday. Top of the pile, as it usually is any week it's released, is Hawkeye #17, and due to the haphazard release schedule it's been beset by over the last few months, we're actually getting the next part of Clint's storyline only two weeks after the last instalment. That offered a doozy of a cliffhanger so I'm eager to see where things go next. None of the issue #1 launches from Marvel this week are appealing to me that much, but Fantastic Four #2 will get a look in to see if James Robinson can build on what he started in the 'debut' issue. Then I've got FBP: Federal Bureau of Physics #8, East Of West #10, Manifest Destiny #5, Mercenary Sea #2 and Deadpool #25, and that's my lot, freeing up some time for me to check what gaps in my collection will need filling come Saturday!